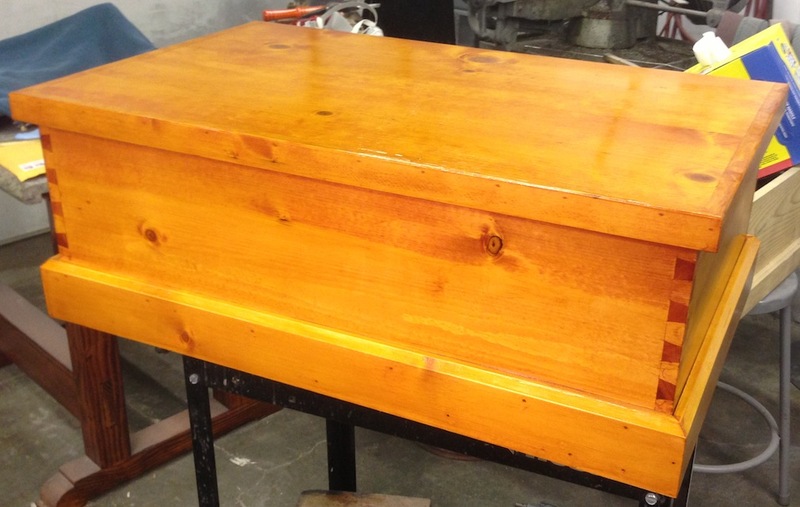 I decided to go with the Cherry Danish Oil basecoat and Orange Shellac topcoat. Between applying finish, sanding, sharpening tools for the chest and running a few errands that pretty much used up the whole day. This was my starting point, sanded to 220, edges chamfered with a block plane. I applied a coat of Cherry Danish Oil with a foam brush, and tried to work in in, especially into the light areat. It’s really weird how some areas just won’t take the finish as well as others. 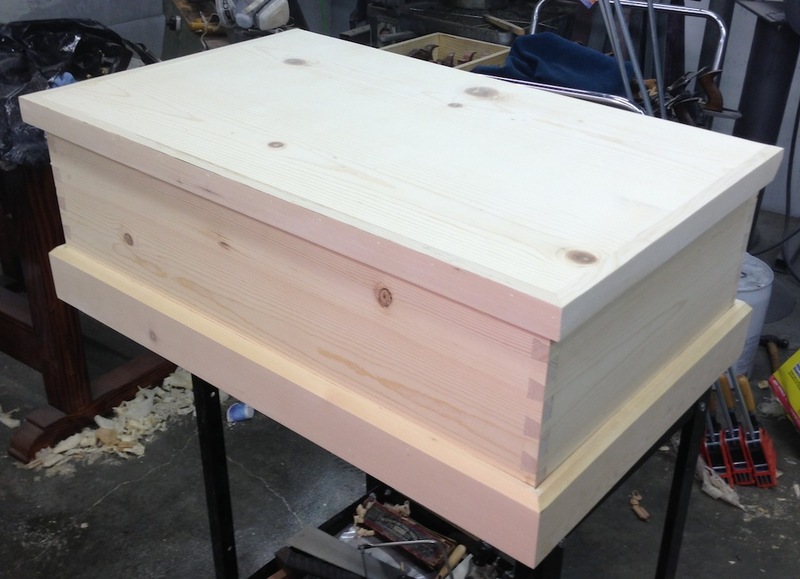 The entire front of the chest is one board, but half of it soaks up the finish and the other half doesn’t. Weird. I wiped it down with a clean cloth and let it dry off for an hour. Then I built up two or three coats of shellac, thinned 50% from the can, which I guess makes it a 1.5lb cut. I was trying to build up some color. I left that to dry for three hours while I ran to the hardware store for some 400 grit sandpaper (which they didn’t have!) and did a few other errands. 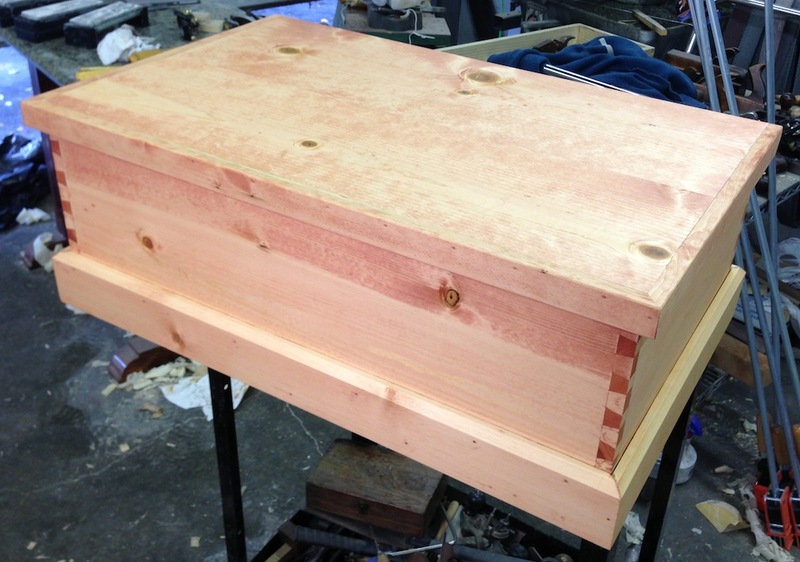 Then I sanded the chest with 320 grit just enough to take the texture out of the finish. Finally I brushed on one final oat of undiluted 3lb cut shellac. I’m letting that dry overnight, in the morning I’ll rub it out with 0000 steel wool and wax it. I’m pretty happy with the way this turned out. The finish really seems to glow. Pine is a difficult wood to stain evenly but it looks good to me. Thanks Ralph. I like the finished color, it’s pretty dramatic and rich in person. Man! this turned out so nice! I hope your excited about how it turned out. Thanks for taking us all along. Thanks for the compliments Marilyn. It was a fun project, and I want one for myself. I have tools piled everywhere. BUT…exciting new developments in shop space coming.